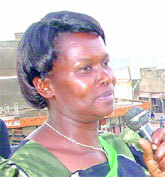 Voters in Masaka district elect a Woman District MP. Agnes Mayanja is carrying the flag for the Democratic Party. DP MPs led by Matia Nsubuga Bireke descended into Uganda's former breadbasket to canvass for Agnes Mayanja.